Horses on the Rocks: Sketches Create the Movement! For quite some time I have been creating artwork by almost exclusively transforming simple shapshots via the creative use of digital art tools that include compositing, blending and filtering, finding this process highly serendipitous and satisfying. In a departure, my newest series “Horses on the Rocks” features some elements first rendered the “old-fashioned way” as hand sketches on paper—very appropriate for inclusion in a current exhibit titled Works on Paper! 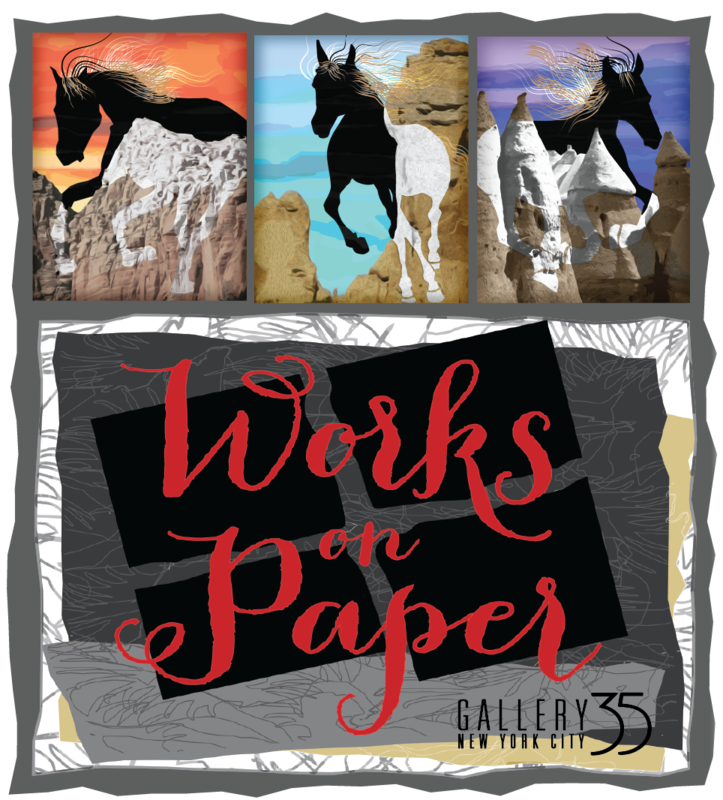 The pencil sketches of the horses in motion were scanned into the computer, re-drawn using a pen tool which creates very clean lines, silhouetted, and finally blended with photographs of striking clouds and dramatic rock formations including Tent Rocks and Chimney Rock in New Mexico and the red rocks of Sedona, AZ. The fantasy manes and tails were drawn totally electronically and added to the mix. I am pleased to show these new works at Gallery35 in New York City, in a group show with 12 other artists, all members of the collective.